MATT Gillett says the Broncos will get two wonderful experiences this weekend - the people of Papua New Guinea and a hard match of rugby league. 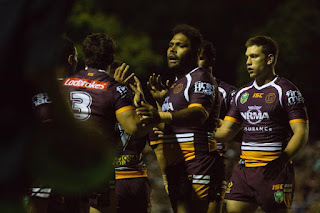 The Broncos leave Brisbane for Port Moresby tomorrow morning to play a match against the PNG Hunters on Saturday afternoon. A huge welcome is expected in the country where rugby league is the national sport. The Broncos will engage in a range of community activities, and Gillett said the players were in for an amazing time. "I have come up against PNG a few times and taking the game over there is something special," he said. "A lot of the boys haven't been over there before so it is good for them to go and experience it. "Plus we get a tough game of footy under our belt. "It is a bit crazy, they really love their footy. "They know each and every player and they call out your name. "You get to the airport and there are thousands coming out just to see you. "It is what it is all about - they love their footy." It is Gillett's first match of the year after he was part of the Kangaroos' World Cup win in December. After a good break and short pre-season, he is raring to go. "I finished early December and had a bit of time away to freshen up. "I came back in January but it has been pretty hard still - the coaches have been driving a hard pre-season. "The body is feeling good, so I am looking forward to that first hit out."